XP Power has launched its low-cost VCE03 and VCE10, 3 W and 10 W series of board-mounted AC-DC power supplies with extended universal input range from 85 VAC to 305 VAC, covering all nominal AC inputs from 100 VAC to 277 VAC in a single ultra-compact design. Both the VCE03 and VCE10 provide a complete AC-DC solution with integrated EMC filter and hold-up capacitor, meaning there are no extra external components required. Their small size, high efficiency and low no load input power consumption makes them well suited for IoT applications. The 3 W parts are available in an ultra-compact encapsulated or open-frame SIP package for maximum flexibility and potential cost and space savings. The compact 10 W parts are offered as encapsulated or open-frame DIP’s. Their high-active efficiency and low no-load input power of less than 0.3 W make these devices suitable for a wide range of applications supporting environmental initiatives for end equipment. 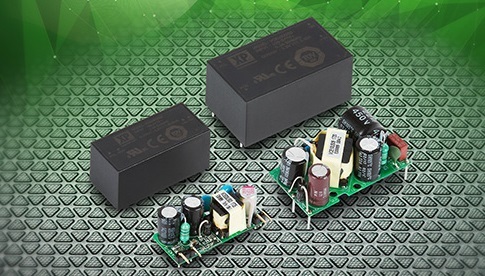 The series offer a wide range of outputs covering 3.3 V, 5 V, 9 V, 12 V, 15 V, 24 V and 48 V with over-load, over-voltage and short circuit protection included. All models are class II, earth-free construction and have 3000 VAC isolation rating with world-wide safety approvals to IEC60950-1 for ITE equipment, IEC/UL/EN62368-1 for ITE and audio-visual equipment and IEC/EN60335-1 for household appliances. The parts comply with EN55032 Level B conducted and radiated emissions. No external heatsinking is required, with convection cooling giving an operating temperature range for both series from -25°C to +70°C, with full power available up to +50°C. The extended input range up to 305 VAC allows use of the parts in 277 VAC nominal systems, common in lighting applications and in industrial areas generally. The parts will find applications in lighting, automation and process control, instrumentation, set-top boxes, household devices, home automation and test & measurement equipment. The VCE03 & VCE10 can also be implemented as auxiliary supplies in larger power conversion systems where they can maintain control circuitry powered on standby, allowing main conversion stages to be fully disabled, reducing standby and no-load losses. 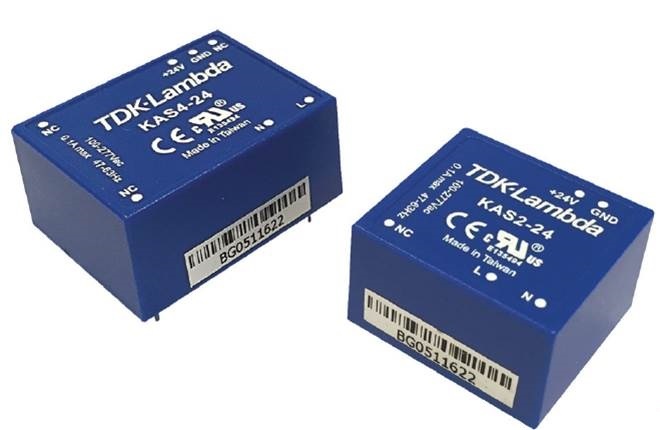 TDK has announced the KAS series AC-DC power supplies, rated at 2 W and 4 W. Accepting a very wide 90 Vac to 305 Vac, 47 Hz – 440 Hz input, these board mounted converters will operate from 115 V, 230 V and 277 V nominal inputs. Target applications include security systems, building automation, professional household appliances, portable equipment and products requiring a separate standby voltage. The series has a double insulated Class II construction, requiring no earth ground connection and has a 3,000 Vac primary to secondary isolation. Available output voltages are 3.3 V, 5 V, 8 V, 9 V, 12 V, 14 V, 15 V and 24 V and have a no-load power consumption of less than 300 mW. The KAS units are encapsulated in a plastic resin fiberglass case, providing additional protection against shock and vibration. The 2W KAS2 measures 28.5 x 25.8 x 17.0 mm and the 4W KAS4 37.0 x 27.5 x 17.5 mm.